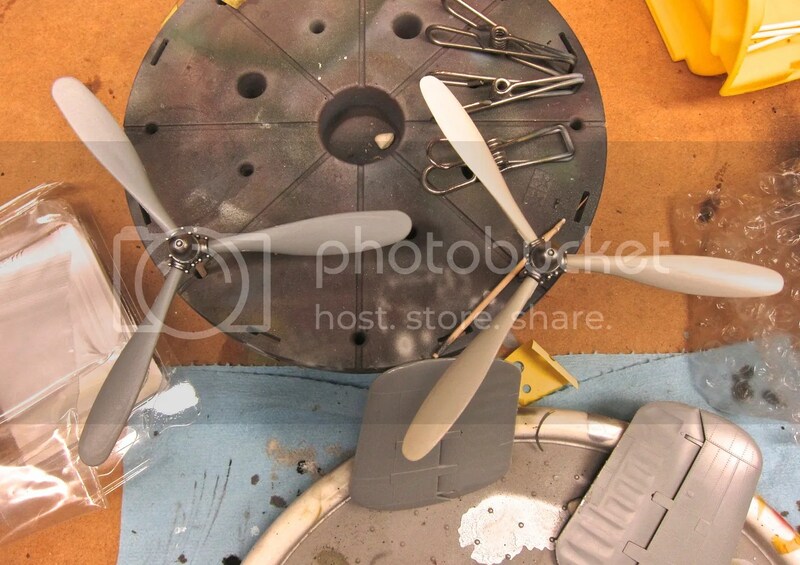 After clearing the bench of the chaos left by the Dewoitine D.520 and P-51B, I situated the B-25’s massive box on part of the work bench and popped it open. Ah, the glorious jumble of half-completed assemblies and halfway denuded sprues! First thing first – spiderweb removal. With my bench being situated in the garage, these tiny spiders are an absolute nuisance in the summertime, getting into my builds and weaving their cursed webs everywhere. The bomb bay in particular was thick with them. Once they were all removed, I broke out the airbrush and sprayed the interior with Tamiya XF-1 Flat Black, then went back over it with thinned Model Master Interior Green, sort of a retroactive adoption of the cockpit painting technique I’d found so effective on the D.520 and Mustang. I also took the opportunity to do some quick test-fitting of Relish Models’ corrected props. I’d originally purchased the AMS prop set, only to shake my head when I realized the mounting posts were far too large for the HK hubs and would require all kinds of work to get a decent fit. The Relish resin, thankfully, offers drop-in replacement convenience, and the props are far better looking than the thick canoe paddles that come with the kit. Work continues on the interior, with drybrushing and weathering for the repainted bits. I also took the opportunity to glue the tail pieces together. The fit across the board is good enough that I’m leaving the fins and control surfaces as separate pieces and won’t lock them down until much further along in the build. The way I figure it, the fewer 90-degree angles I have to deal with during painting, the better, since it’s still hot and dusting is a perpetual concern. In between dealing with several small details necessary to close the fuselage, I spent some time mounting the waist guns. These are both clever and extremely frustrating in their design. Clever because HK designed all of the guns so that the barrels could be installed near the end of the build. Frustrating because the waist guns don’t have a positive “snap it in place right here” location the way all the others do. The guns themselves have posts molded on their undersides, which you get to glue into a little cutout just inside the waist windows. Presumably the ammo belts sloping down from the bulkheads locate the guns, but there’s basically no positive location there, either. 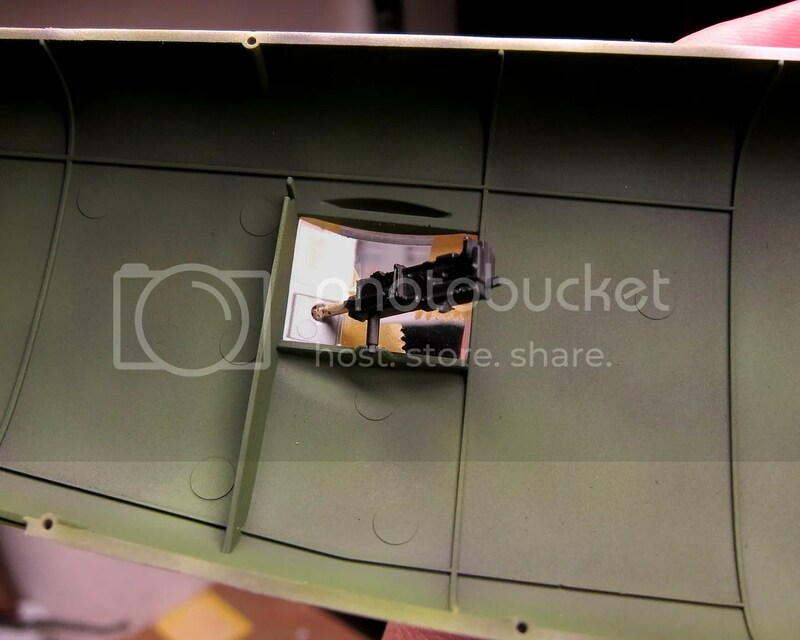 So I decided to work backwards, taping the waist window assembly into place and using it and the Profimodeller machine gun barrel to locate the gun properly. Once I had them in place, I glued each gun assembly with CA glue. Below is the finished and mounted gun with the ammo belt sloping down off the bulkhead. The kit ammo belts are decent…they look pretty good from the top, actually, but pretty weak from the side, which is all you can see of them from the windows. Oh well…they’re as good as anything else I can think up, and they’ll be mostly hidden once the windows go in anyway. 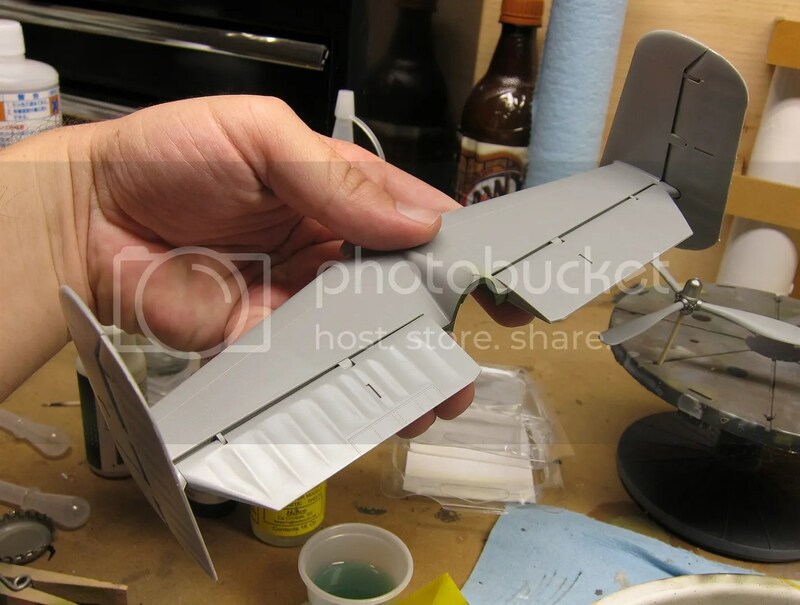 With the waist guns in place, I moved on to the major step of closing up the fuselage. The fit of the HK kit at this stage is both exceptional and frustrating. Everything lines up and fits…but the kit is so big that it exerts force on itself and is constantly popping apart. Even holding it together to weld it shut with Tenax 7R took copious amounts of Tamiya tape. And none of that puny 6mm stuff. With the fuselage closed, I next moved on to the wings. 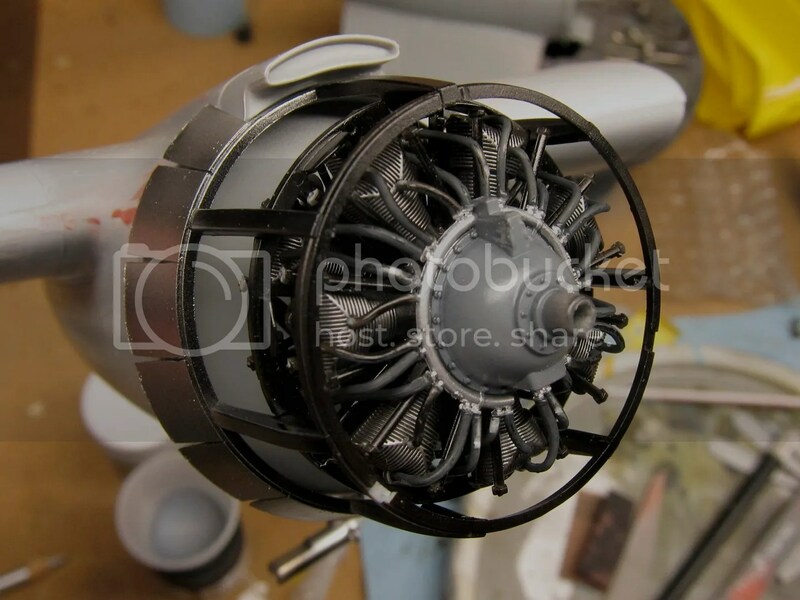 Since the kit requires that you attach the main landing gear struts before the engine pods, I decided to start there. After fitting the crazy-beefy G-Factor white bronze struts in place, I smeared the outside of the mounting post with 15-minute epoxy. Everything was looking great until I realized that I’d installed the struts backward. They should have a slight forward cant, and the oleo scissors should face front, not aft. Obviously, I couldn’t allow something as boneheaded as installing the landing gear backward to stand. Fortunately, I’d only smeared epoxy around the outside of the mounting hole with the gear already inserted. It chipped away easily with a few digs of a chisel blade, and I was able to swap the gear to the proper wings. 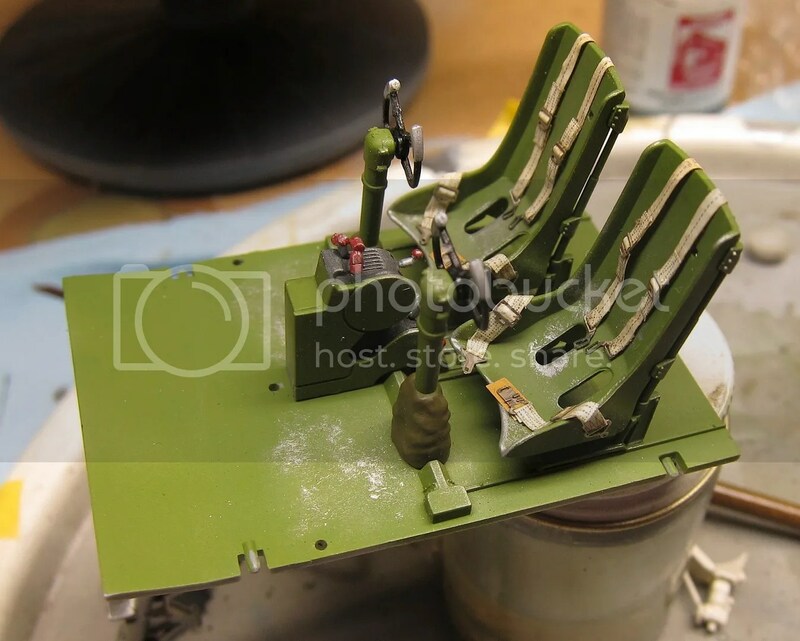 While the reapplied epoxy set, I took the time to knock out the rest of the control surfaces that needed assembly. 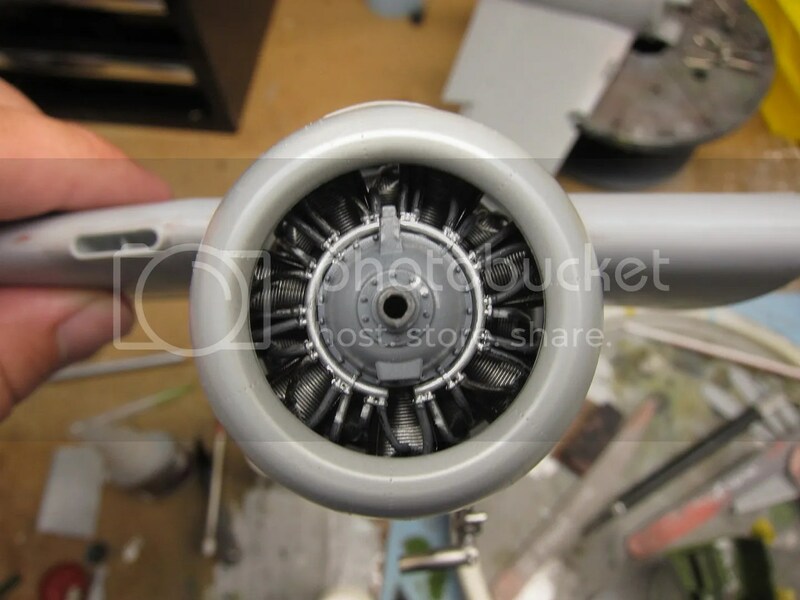 My plan from here is to remove the wings and paint them and the fuselage separately. The slide-lock mechanism on the wings is pretty slick, but really tight. As in…even when the wings are just taped together, I can get them on, but can’t get them off again. So the bomber won’t be whole again until at least after paint. In consideration of that, I decided a major test-fit was in order. One thing I hate – tiny clear parts that have to be installed before you can even assemble things. Well, the recognition lights on the underside of the starboard wing are exactly this kind of annoyingness. I’d originally planned to get around the agony of precise masking by painting the area around them first, but, to be honest, they looked kind of like crap, so off to Sprue Brothers for some MV lenses. In the meantime, I closed up the wings and rest of the control surfaces. The first cool front of the fall arrived, kicking temperatures down from 100+ to around 90! During benchtime hours, temperatures plunged toward 70, and I was finally able to enjoy a night in the garage without resorting to the portable A/C. As dry as it was, it would have been a great night for painting. Alas…seam work called. More seam work! 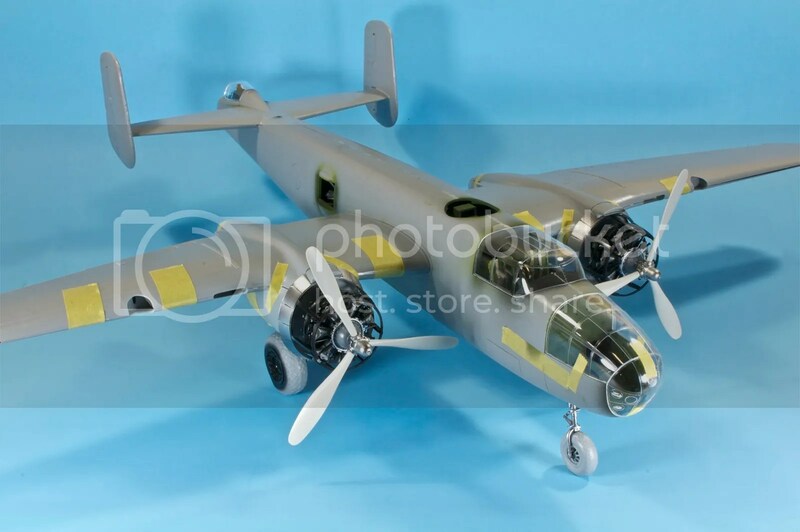 The B-25’s fit is excellent, really, but even so I haven’t mastered the “no filler was needed anywhere” magic that I hear tell of in certain reviews. Maybe I’m too clumsy with my Touch-n-Flow or, as often, too clumsy dealing with those damn seam-side sprue attachment points. 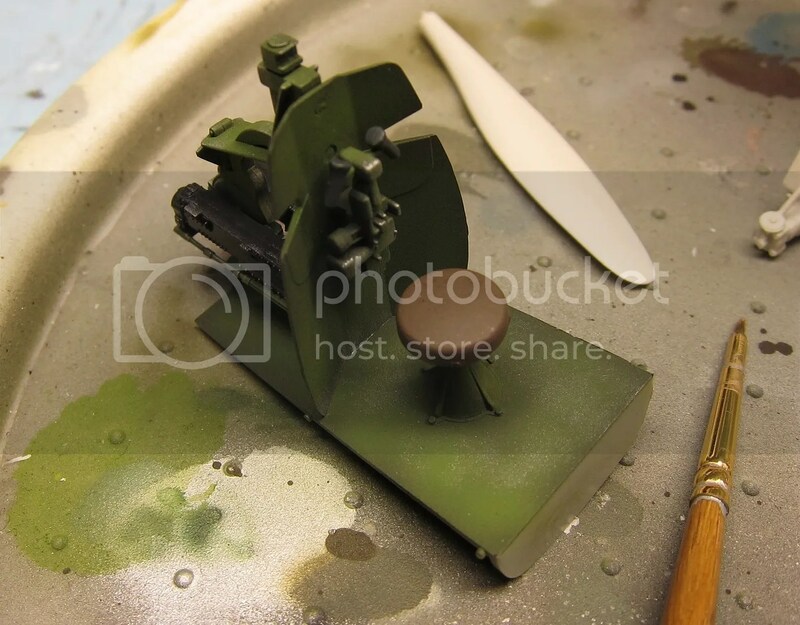 Whatever the case, the pain of this kit isn’t the fit, it’s sanding those seams and putty smooth without destroying all the beautiful rivet detail. 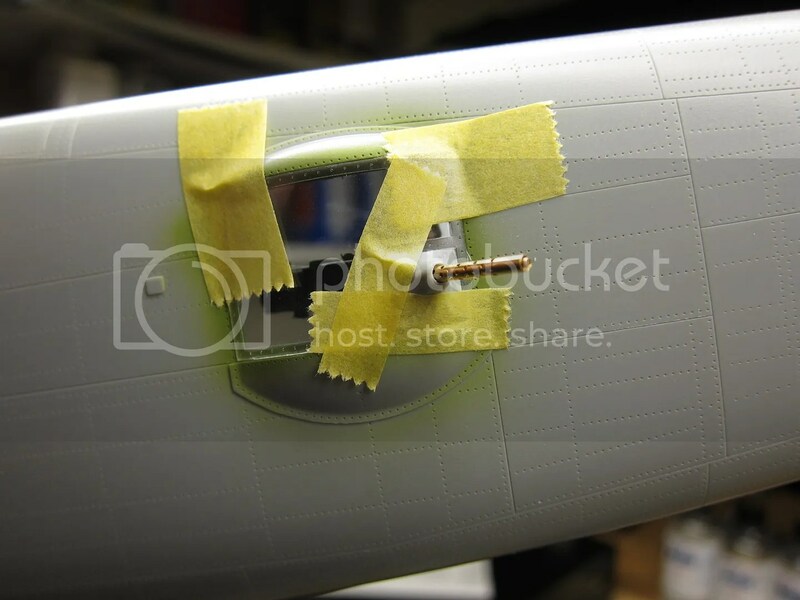 Working with sandpaper, sanding sticks and micromesh pads, I managed to get most of the fuselage spine under control. And hey, yet another night of sanding! This is always the time when I get super-frustrated with a build. Sanding is far and away my least favorite aspect of any build. It feels like running in place. After a night off, another night of…you guessed it…sanding! I also moved on to adding the “flap internals”, for lack of a better word. This is honestly the first part of the kit I’ve encountered that’s just head-smackingly retarded. These internal plates basically snap into gaps at the back of the wing and form sort of the internal buttress for the flaps. But the instructions don’t make it clear at all how they go in, so this moron welded them to the edges at first. Thank goodness for Xacto knives. With the internal buttresses in place, I elected to go ahead and glue down the outside flaps and then called it a night. A minor bout of excitement this evening as my MV lenses arrived – until I realized I can’t install them until way, way down the line. 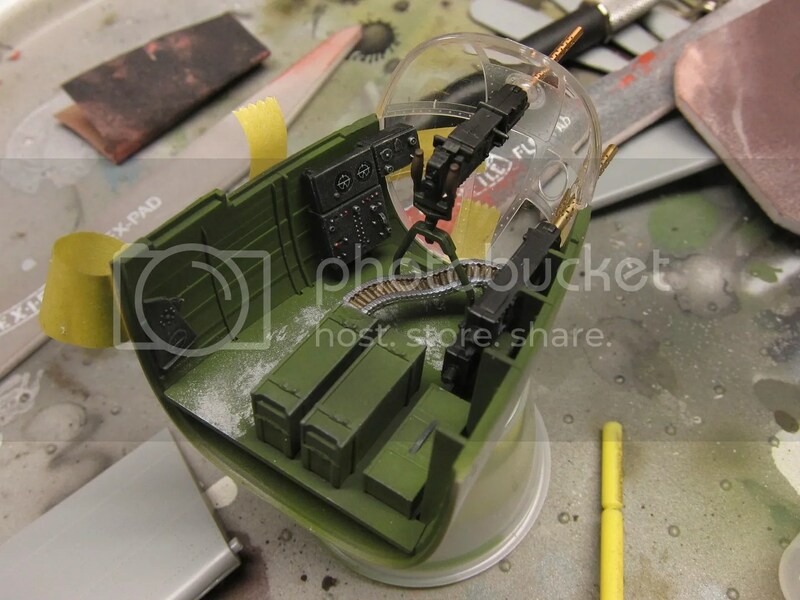 I also got a start on finishing out the bombardier’s compartment (aka “the glass nose”). First thing’s first – guns. Since these have to align with barrels that poke through the nose glass, I taped the forward clear piece down and used it as a guide to make sure everything was as it should be. I still need to do some touch-up painting of one of the gun platforms, and need to paint the .50 cals up right, but at least everything lines up. I also did some work on the engines – the HK kit has a trick arrangement where the crankcase has a cylinder extending back to mount to the firewall. Just one catch – it’s a really tight fit, and the cylinder banks developed a tendency to slip off and back. So I reamed out the mounting hole and now everything slides on and off like butter. After priming the Relish prop blades, I shot the tips with Gunze C316 Insignia White, then C4 Yellow. Next up will be masking the tips and painting the rest black. Up front, I added back some of the switchboards and control panels, drybrushed the .50 cal guns with Model Master Metalizer Dark Anodonic Gray, mounted the guns, and added the first ammo feed belt. The Profimodeler brass barrels were used to ensure proper alignment. Once everything sets up, I’ll add the remaining two ammo feeds, the remaining ammo boxes, and the Norden bombsight. On the engines, I finally glued the crankcases to the cylinder banks tonight, and did the wiring shuffle on one of the engines. HK is the first manufacturer I’ve ever seen to provide the engine wiring harness as individual plastic “cables”, and the approach is just so novel that I had to give it a go. To my amazement, they actually fit really well with a dab of Gator’s Grip on either end. Perhaps a bit over-scale, but as their dark gray/black, I don’t see it as a big deal. One additional view with the cowl in place. The long slog toward getting the B-25 into paint continues. 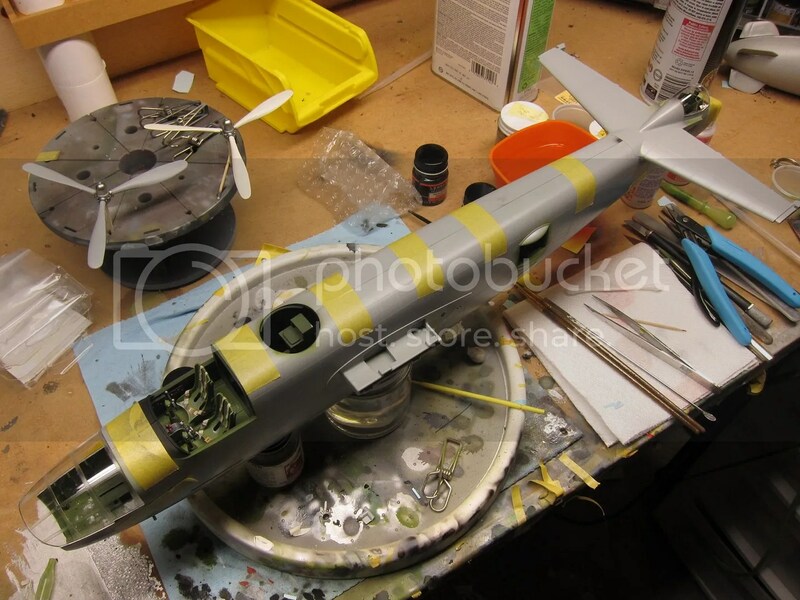 Over the past few evenings, I’ve been doing a lot of test fitting of the bombardier’s section to the main fuselage. The Norden bombsight has been installed as well, though I still have to attend to the top ammo boxes and the feed belt going to the center machine gun. This one’s going to be frustrating, as the location for the ammo boxes is extremely vague, and I don’t want the feed interfering with the glass. My plan at this point is to try to glue them both at once, which will doubtless result in many expletives. 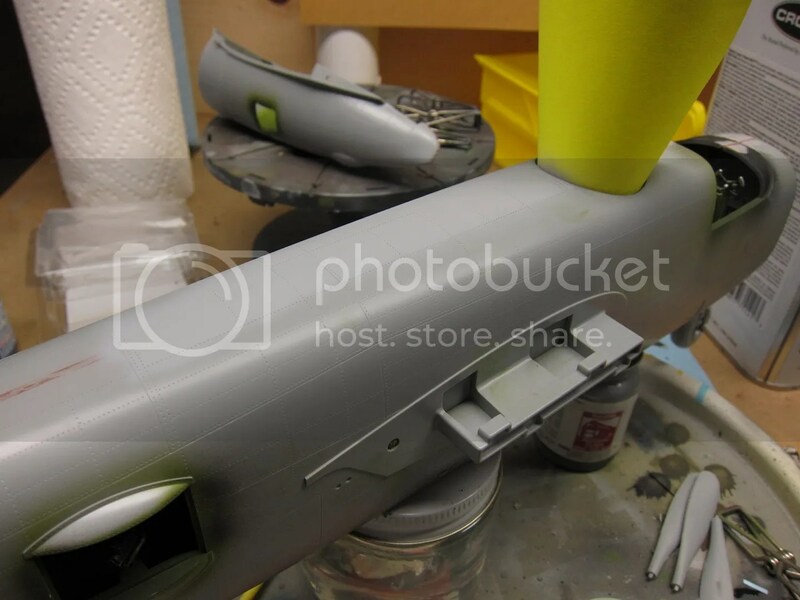 The props have been painted now…they still need the various decals applied, but will probably be the first part of the kit that actually gets done. The second engine has been wired up, and the next step is to add the cylinder covers. Since I’m doing the cowls fully closed up, chances are decent I’m only going to worry about the forward bank of cylinder covers. And here, I think, is a decent stopping point for Part I of the B-25 build. Head on over to PART 2 to follow the build into the paintbooth! Clear PVA glue – either Gator’s Grip or Micro Krystal Klear are my favorites. Been building models for about 10 years and gave it up 4 years back. 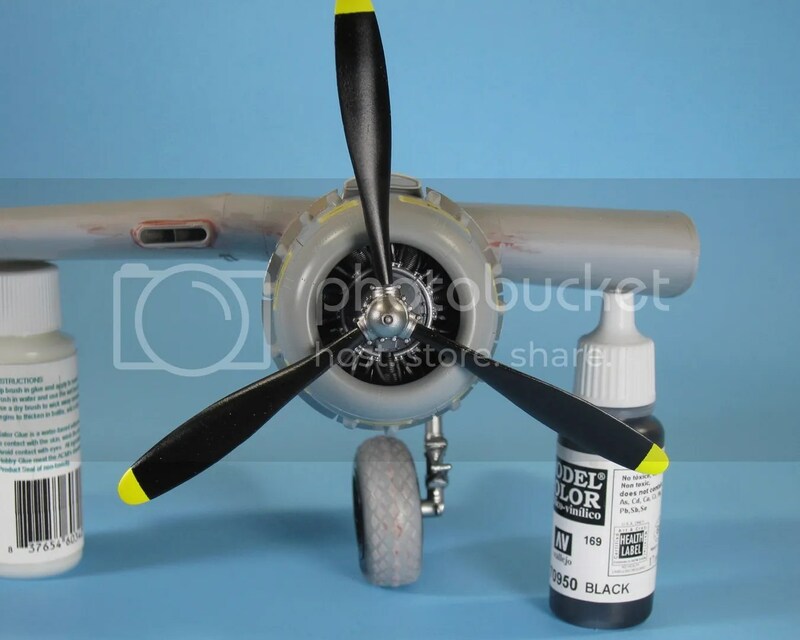 Thought I would try one very simple build first, (Revell’s 1/32 Mosquito then get down to business with an HK B-25. I’m really glad I took the time to read your stuff as it has inspired me to do some research on techniques and materials before I jump back in. You seem to have a good handle on your craft and I think I’ll benefit significantly by following your advise on many of the challenges this hobby presents. Thanks for taking the time to write about it.